Achieving health through nutritious food choices has never been simpler nor more delicious thanks to The Healing Kitchen! Armed with more than 175 budget-friendly, quick and easy recipes made with everyday ingredients, you get to minimize time and effort preparing healthful foods without sacrificing flavor! Straightforward explanations and a comprehensive collection of visual guides will teach you which foods are the best choices to mitigate chronic illnesses, including autoimmune disease. Real-life practical tips on everything from cleaning out your pantry and easy ingredient swaps to reinventing leftovers and DIY flavor combinations will help you go from theory to practice effortlessly. Even better, twelve 1-week meal plans with shopping lists takes all the guesswork out of your weekly trip to the grocery store! With half of all Americans taking at least one prescription medication (and 20% of us taking three or more! ), there is a clear need for something to change. Combined with growing scientific evidence pointing to the Standard American Diet being at least partly to blame for our declining health, it’s time for a dietary shift toward nutrient-dense, anti-inflammatory whole foods that promote health, rather than undermine it. In the first part of The Healing Kitchen, you’ll learn all about what foods to eat and why, based on an ancestral diet template with contemporary scientific underpinnings. With a collection of practical tips and visual guides to distill this information into simple real-life actions that you can implement easily in your home today, this book is the closest thing to a guarantee of success that you can have when embarking on a Paleo diet healing protocol. The Healing Kitchen features over 175 mouthwatering recipes that make eating healthful foods easy enough to fit even into the busiest of lives, while being so tasty you’ll likely forget you’re on a special diet to begin with! Compliant with the Paleo autoimmune protocol, every meal is budget-conscious, requires a minimal time commitment, uses no special equipment, and needs no hard-to-find ingredients—yet, the whole family will love it! There’s no need to suffer with bland or boring foods on your journey towards optimal health—and The Healing Kitchen is all about enjoying tasty food while nourishing your body. The recipes span the gamut from easy peasy mains and simple sides to breakfast favorites and timeless treats. Even better, each recipe is labelled by cooking strategy, so you can easily identify meals that are one-pot, use 5 ingredients or less, take 20 minutes or less, can be made ahead, feature a slow cooker, and on-the-go foods—to make planning your day effortless! The Healing Kitchen also includes twelve weekly meal plans, each with a shopping list, to help you get completely organized in your kitchen! Even better, the selection of thematic meal plans hone in on your individual needs. Can’t spend more than 20 minutes cooking at a time? The 20-minute-or-less meal plan makes sure your time spent preparing food is as minimal as possible. Always eating on the run? The on-the-go meal plan will suit your needs perfectly. Have a whole crew you need to satisfy? The family-favorites meal plan will please kids and grown-ups alike. Want to do all of your cooking for the week in one afternoon? Two batch-cook meal plans complete with exclusive web links to companion How To cooking videos will help you get it done! The Healing Kitchen is your best tool for turning your kitchen into healing central—all while minimizing your time commitment, keeping your food budget reigned-in, and enjoying bite after delicious bite of meals to nourish and thrive. The Healing Kitchen is available wherever books are sold. It is available on Amazon, Barnes & Noble, from independent bookstores (find one near you using Indiebound) and at Costco! If you live outside the USA, you can purchase the book from BookDepository and receive free international shipping! The Healing Kitchen is also available on Kindle, iTunes, Nook and Kobo. The Healing Kitchen is the perfect solution for anyone looking to improve their health without sacrificing flavor, spending hours in the kitchen, or breaking the bank with expensive ingredients. With outstanding organizational resources, a comprehensive yet easy-to-understand breakdown of what to eat and why, and a ton of delicious yet accessible recipes, this book is a must-have for your own healing kitchen. Food is the best medicine, but to fit healing food into our busy lives, it needs to be easy to prepare; and to motivate us to cook it should be delicious. Cooking AIP-style is another challenge. Alaena Haber and Sarah Ballantyne have worked hard to show you how to overcome these barriers to health with delicious, easy to prepare, autoimmune-friendly recipes for busy home cooks. If you follow AIP, this is a must-have! Simply put – Sarah and Alaena have raised the bar with The Healing Kitchen. This book is destined to be the new standard for what it means to eat a healthy, nutrient-dense diet and should be required reading for anyone interested in better health for themselves or their family. Alaena and Sarah have created a comprehensive Paleo reference that also doubles as a beautiful cookbook for busy yet food-obsessed folks. I love that The Healing Kitchen focuses on “normal” ingredients, timesaving tips, and meal planning techniques that don’t sacrifice flavor or nutrient density! Bravo! Do you want to heal? Begin by reading The Healing Kitchen. There is hope—and it begins with the real food, “nutrients first” approach in this book. Alaena and Sarah know what it’s like to reclaim health and recover from autoimmune disease, and they’ve outlined their approach, along with scrumptious recipes, so you can do the same. You’ll be astounded at their stories, and you’ll be ready—no, I mean really ready! —to reclaim your health for good. Alaena and Sarah do not disappoint when it comes to their knowledge bombs or recipes in this book! With The Healing Kitchen, you are constantly learning new information about the food you are eating and how to heal yourself with every meal you try from their book. Be ready to learn, cook, and see your health improving all because of this cookbook! The Healing Kitchen Delivers! In The Healing Kitchen, authors Alaena Haber and Sarah Ballantyne PhD have created a beautiful, practical, and absolutely essential resource for anyone suffering from autoimmune disease. At first glance, the Autoimmune Protocol (AIP), which The Healing Kitchen is based upon, appears to be a restrictive and difficult way of eating, but after seeing page after page of appetizing and AIP friendly recipes like Bacon-herb Biscuits, Honey Lime Chicken and Strawberry Salad, and Prosciutto and Fig Bistro Pizza the prospect of going AIP suddenly seems a lot more appealing. As we have come to expect from Sarah Ballantyne however, this book isn’t simply “another pretty face”, the science undergirding the recipes is rock solid and thoroughly researched, making this a stimulating read for both the intellect and the appetite. Sarah Ballantyne’s and Alaena Haber’s new book, The Healing Kitchen, is the Swiss army knife to managing true health through real, nutritious, and above all; delicious food. With the rapid increase of chronic food illnesses that are commonly misunderstood, The Healing Kitchen has a way for everyone to bring their body back to a healthy equilibrium. They have made it extremely easy to navigate what to eat through carefully articulated descriptions that are not only easy to understand, but easy to put into action. After covering everything you need to know, this book provides over 175 easy to make recipes like fennel mandarin slaw, prosciutto and fig bistro pizza, and teriyaki chicken and fried rice, that are not only nutrient dense but mouthwatering to boot. If you’re tired of feeling trapped by health issues and overwhelmed by the idea of learning to cook healthy food, this is the book for you! Sarah Ballantyne’s gift for translating a wealth of scientific and dietary information into something that the rest of us can understand and apply to our lives is second to none. With hundreds of pages of easy to understand nutritional info and gorgeously photographed recipes, The Healing Kitchen is the perfect resource for people who want to take charge of their health and be inspired to live life more vibrantly. The nutrients-first approach in The Healing Kitchen both details the whys and hows of a nourishing, anti-inflammatory diet as well as recipes for an approachable, delicious way to implement it! Pair the leader of the AIP community with one of the most talented young AIP cooks, and you have one of the best cookbook resources to ever hit the Paleo shelves! The Healing Kitchen is packed with approachable recipes, using familiar ingredients that make it easy to eat tasty, nourishing meals while following the Autoimmune Protocol. With its emphasis on speedy, simple meals, this cookbook proves you don’t have to spend hours in the kitchen to enjoy good food! At its core, The Healing Kitchen contains three simple concepts. First, it is a extensive guide to the most healthful and nourishing foods. Next, it contains masterful recipes to prepare those foods in the most deliciously way possible. Finally, Sarah and Alaena somehow figured out how to put it all together in a comprehensive, do-able guide for our busy modern lives. 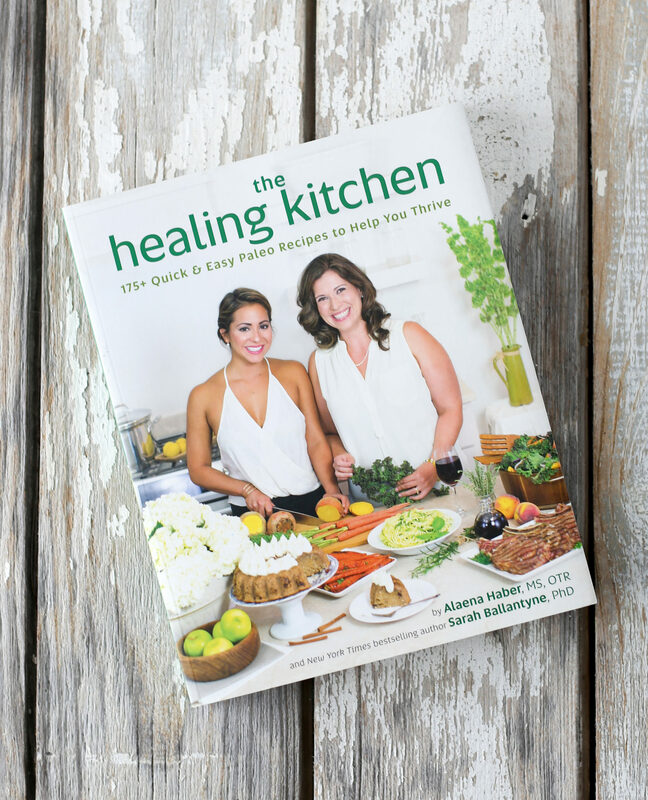 This is a must-have resource for your own healing kitchen! The Healing Kitchen is a must-have book for anyone following the Autoimmune Protocol. Sarah and Alaena have joined forces for this book, and the result is a great balance of diet theory and cooking implementation. The distilled and easy-to-understand science behind the diet, practical tips, meal plans, and everyday recipes all add up to an all-in-one book that hits all the right notes.